V215: Interview with Alicia of "Little Bits Clothing Company"
Hi All! 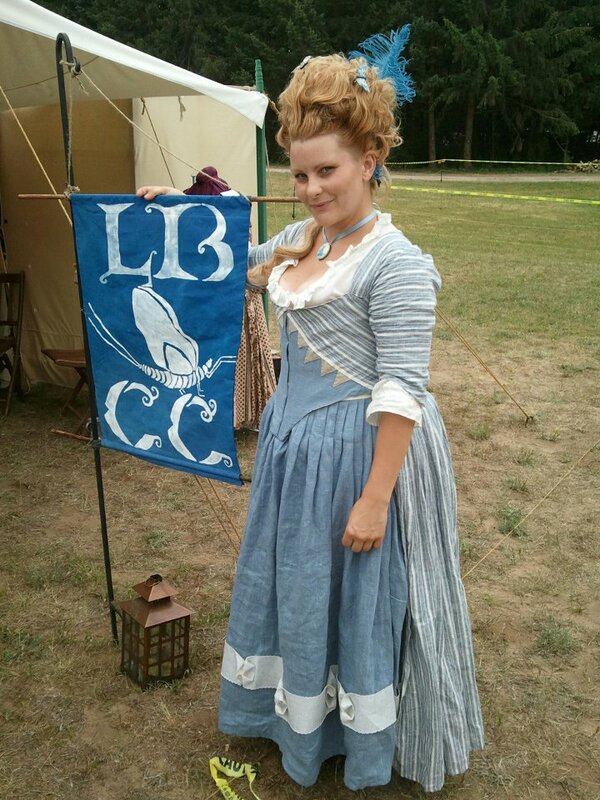 Today I've got an interview with Alicia of "Little Bits Clothing Company," a great little business creating reproduction historical gowns of the 18th and 19th centuries, along with a whole line of lip balms, salves, custom tea blends, and conditioners made from period recipes. You can find Little Bits on Etsy and also Facebook, and have a drool over her awesome product line. I feel like I was born into it. I was always interested in history from little on. My Grandma would show me historical photos and we would talk about the clothing. Every once in a while she would bring out family heirlooms that I could try on. We would go to Antique stores and I would purchase old clothing and take it home just to stare at it. My friends have said that my talent has come from being an “old soul” and “osmosis”. I never really thought about making clothing until my parents took me to a reenactment at the age of 8 or so. I wanted so badly to be dressed. The costumes were expensive. Needless to say, I did not get an outfit. I quickly realized that if I wanted an outfit, I needed to learn to sew. I started reading a lot of costuming and historical books. I am happy I am self-taught. It allowed me a better understanding of the different methods in which historical garments were constructed. I began taking photos from historical books and if my garment didn’t look exactly like the one in the book as far as the drape and fit on the form, I would sit and figure out why. Practice and repeat. With that said, a lot of it is just natural for me. In the beginning, my garments were made from things like thrift store choir robes. 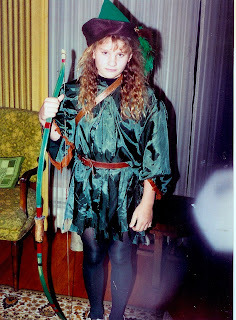 My first 2 costumes I made were Robin Hood and Cleopatra. I was so proud of myself for gluing all the sequins to make a collar. Trust me they weren’t anything grand by any means. But I researched and put a lot of work into them and I thought they were the coolest thing. In high school I really became interested in how clothing related to the “everyday life” and how it told the story of the wearer. I started costuming high school shows, and going to reenactments. I really started focusing on making my costumes authentic and as life-like as possible. I didn’t like that people called them costumes because to me they were everyday clothing that our ancestors wore. 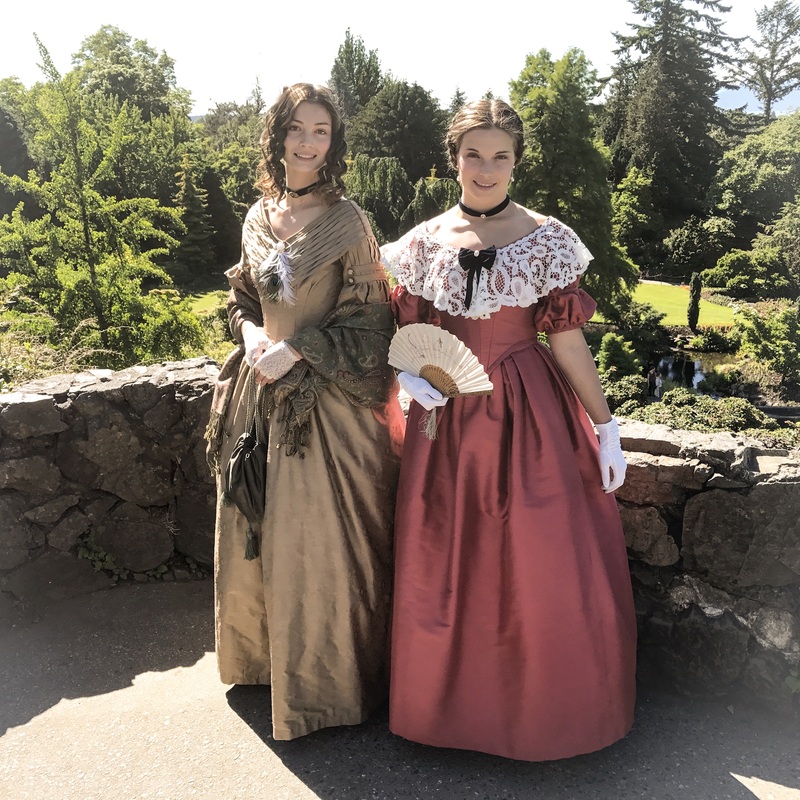 For me, I felt that the difference was I wasn’t pretending to be like them, I wanted the full experience, so I tried to make my costumes mimic the historical clothing I was buying and reading about. I also surrounded myself in old things, I did homework by candlelight, and stored my costumes in a trunk. I put some of my things on Ebay-just to see what happened. I was shocked that my listings did so well. I just assumed I’d be a history teacher or work in a museum. As the years went on, I started putting more and more things up for sale and would set up a small shop here and there at events. Soon after, I was asked to do custom work. I put the physical hobby of sewing on hold for college. I still continued to research, collect vintage clothing, and sew in my spare time. I spent 5 years in college and obtained a Major in History, Broad-field Social Science and Minors in Anthropology and Museum Methods. After college, I took a few jobs, one teaching in an original 1904 schoolhouse and the other as a curator of a historical house, working my way up to Special Projects Coordinator at the historical museum. I slowly started to put things out there on the web. And in 2008 opened my ETSY store as a hobby. At that time I was working a lot of different jobs at a few museums and the theater, Joann Fabrics, and a few others (just because I can’t sit still). When the economy tanked I was let go from my main museum jobs and really threw myself into building a small business. I had a name already because I was advised to come up with one in high school. I had chosen “LitttleBits”. It was a name given to me at the historical reenactments I attended, mostly by myself, sometimes a friend or two. Etsy put another “t” in my name so now its LitttleBits. The success didn’t happen over night. I wasn’t able to quit my other jobs for a few years. Now I am full time and shipping things to museums, forts, and reenactors all over the world. 2. How do you see yourself as a costumer? 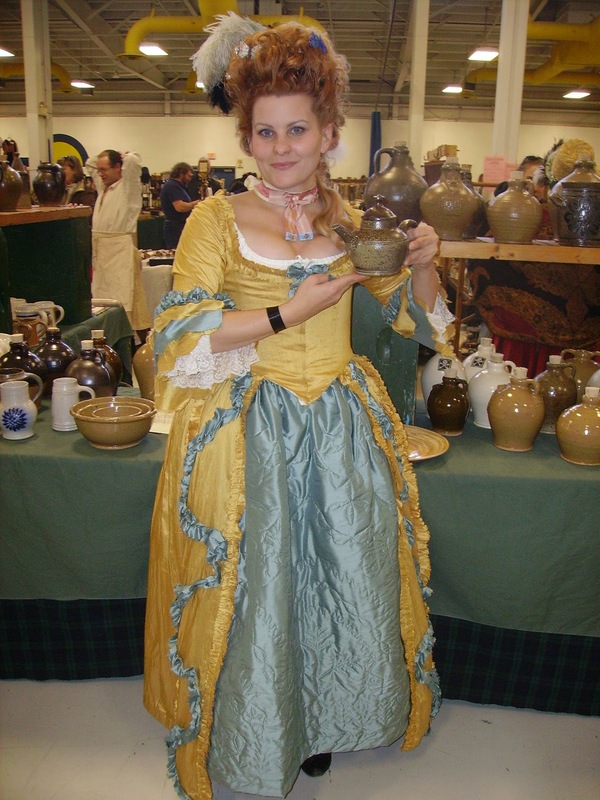 Are you a re-enactor, a theatrical costumer, or a just-for-fun type? As far as giving myself a specific title under costumer, these days I prefer Historical Clothier, Re-enactor, and Historical Interpreter. However, in the past I have been all of these (re-enactor, a theatrical costumer, or a just-for-fun type). 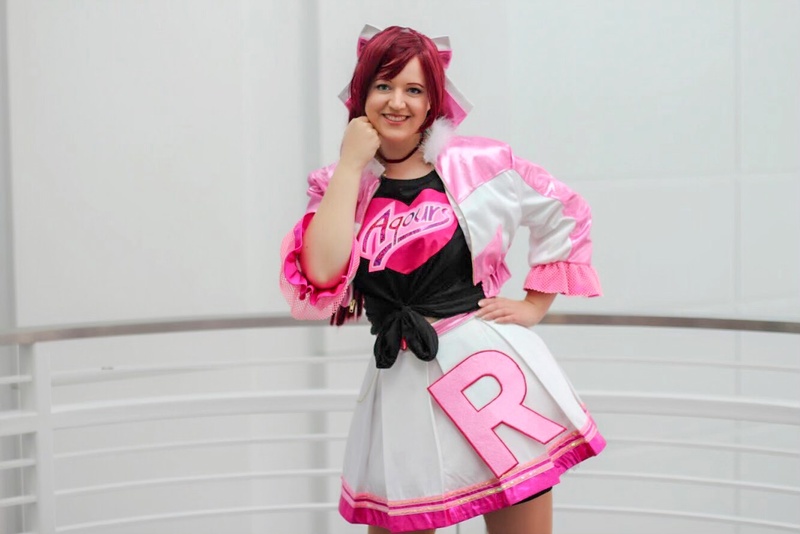 I started out as a just for fun hobby costumer and then in high school I started learning about theater and after college I even worked in a professional theater. I think this helped me in my endeavors A LOT. I was able to see how the theater costumes were constructed. I was able to fix them, make them, and then design them as well. I was also able to pick people’s brains. It was a good foundation for learning the historical craft. I was able to see a lot of similarities in how certain gowns were created, how things were tailored, how the hairpieces were made, and how lighting affects the color of the garment. It was a huge education for me. I have also been a re-enactor for over 17 years. I understand the work and love people put into their creations at all levels. I think about my first creations a lot. 3. What is your favorite garment to sew? What is the most challenging? This is a tough question… I love fashion in general…I honestly don’t know which is my favorite. I love any garment that I can drape. Even when I was little learning how to sew, I hated patterns. I hated the instructions and I soon decided they were a waste of my time. So every garment ordered from me is draped to unique measurements. I love to observe, especially when people are dressed up. 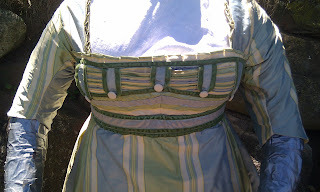 A while ago I noticed a lot of women having problems with ill-fitting stays and corsets. After all the hard work so many put into their garments, I decided that I wanted to help fix this issue. It is hard for many women to take a commercial stay pattern and adjust it for their measurements, let alone tackle the instructions. 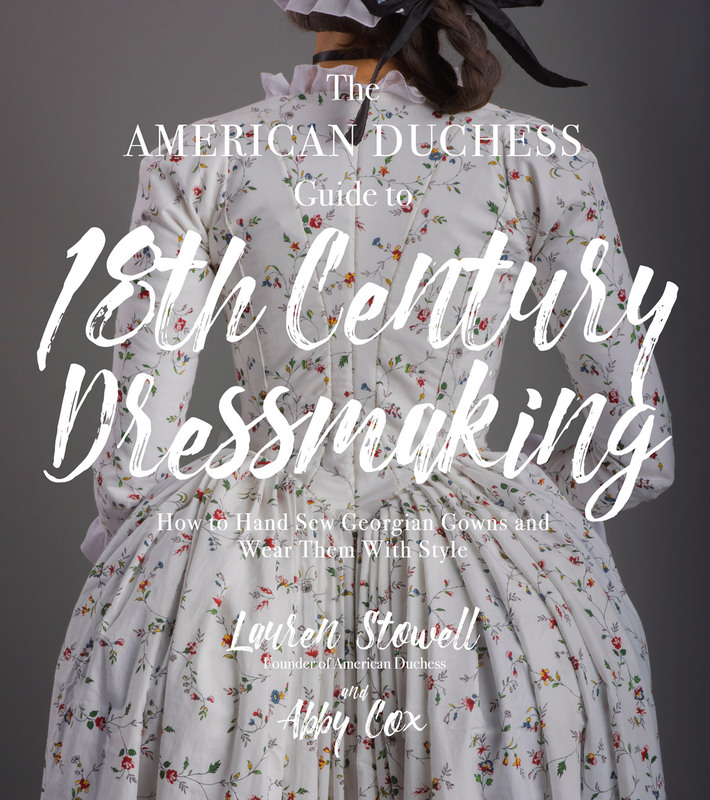 So I came up with a book that works off photos and easy instructions with a custom drafted pattern so you know your 18th century stays will fit right after you put all that hard work into them and the best part is I have included all my contact info incase you get stuck. They have been so well received. I want to work on more products like this eventually. I always think every time I take on a new order, it will be a piece of cake. Most of the time I totally underestimate myself. I love that challenge. One of the interesting things I have learned along the way is that posture makes a difference in the fit of clothing and that is why undergarments or foundation garments are so important to the final look. Today, our posture is completely changed from our ancestors. An example of this challenge comes into play with men’s 18th century frock coats. 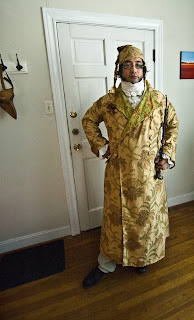 The first frock coat I made, I couldn’t figure out why it wanted to pull backwards instead of forwards around the neck. I assumed part of the problem was that the skirting; especially in the early part of the century the weight can be an issue. The other issue which I never though of was posture. Because I am drafting off historical pieces I am drafting the seam lines exactly as they were at that time; a time in which posture was completely different and so were the shoulder seam placements. Today, most gentlemen need that seam in a different position. An 18th century Gent would have stood straight with his shoulders pushed extremely far back and chest out. I had to try to see if this was the answer. And sure enough it was. It is the unique things like this that I find so fascinating and challenging about historical clothing. I would have to say my favorite garment to sew is a garment in which I don’t have specifics other than a date and some museum photographs as well as the clients’ undergarments. I can let the fabric “talk” to me instead of me trying to force something out of it. Sometimes I have fabric draped to a form for a few days before I finally decide on a “look” or “direction”. 4.What is your preferred time period? What draws you to this particular time period, and are there other periods you are interested in as well? I love all time periods. I have always been fascinated with the bustles but have yet to make a bustle gown. I love the 1930’s, 40’s and 50’s. For a long time I was a vintage Model, a Marilyn Monroe, and Lucille Ball impersonator around Wisconsin. I love trying to exactly imitate the “look” of all those periods. When I was teaching in the 1904 one-room schoolhouse, I fell in love with the early 20th century styles. I had the Gibson Girl hairstyle down to 5 minutes in the morning, having slept in curlers the night before. 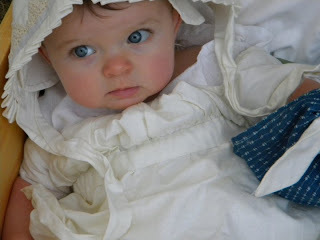 All Time Favorite: I re-enact the late 18th century and I love the fashions from that time. You would think I have tons of reproduced historical clothing, but I don’t. It’s the whole, “The cobblers children don’t have shoes” type of thing. Now that I have a marquee and have a “real” shop I did make myself a new dress and am slowly building my wardrobe with nice gowns. 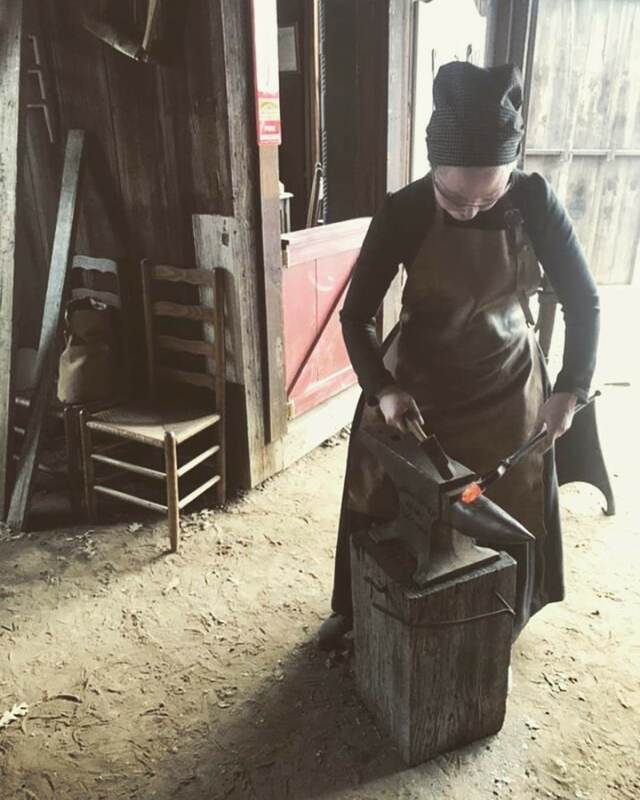 Previous to this, I was portraying a normal everyday hard-working woman; making soap, sewing, or cooking so my clothing consisted of 2 caps, 2 aprons, 2 shorter petticoats, 2 short jackets, a short gown, 1 shift, and a well worn linen dress. At one point, my shift was so patched and thread bare that a friend actually surprised me with a new one. The clothing I wear now is a lot different when running my shop. I love being able to dress up for an 18th Century ball with silk gowns and tall hair. That late 18th century look to me is so beautiful, feminine, and elegant. That is one thing I love about having a marquee to set up shop. I can finally wear nice dresses and tall hair. 5. 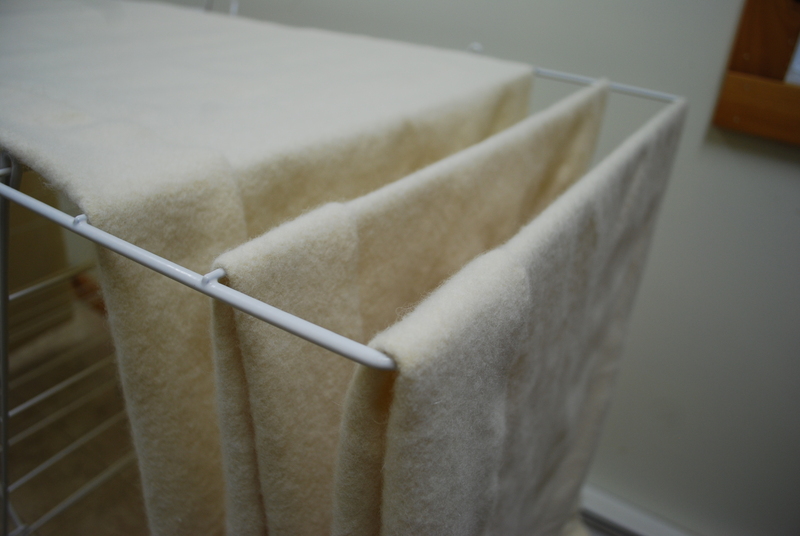 What are your favorite materials to sew with? What do your customers most request? My 2 favorite materials would be linen first and silk second. I love linen. I love the feel of it and how it drapes and creases. The feel on your skin is amazing. It keeps you cool in the summer and helps keep you warm in the winter. Silk would be my next favorite. I fall in love every time I finish a silk gown. With so many types of silk, it never gets boring. I love fabrics with body. I am really picky about the fabrics I use. I try to stay as historical as I can to the period I’m working in. Sometimes it can take a long time to fabric search. It really varies a lot. I love it when customers come to me with a painting or new museum garment I haven’t seen, but if we were to go off my website: www.litttlebits.etsy.com I would have to break it down. I have so many Banyans on my calendar at this moment. I am just swamped with them. I have some orders for women’s as well. The next most requested thing would be 18th Century Frock coats. I have actually taken a break from them for a while because I have made so many in the last year. The third thing is neck stocks. They get ordered all the time. This is a little different, most of the orders that women place are quite custom. I always have a lot of corset and stay orders to fill. 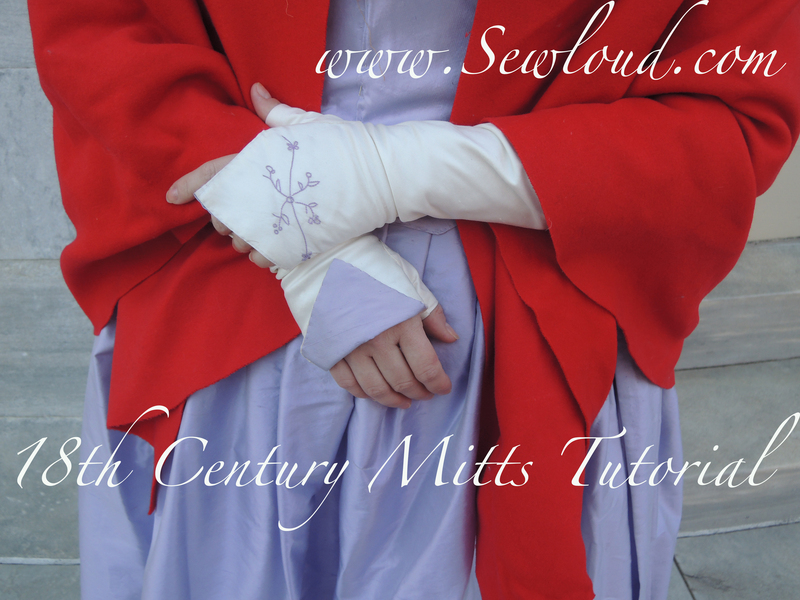 There are many orders for red cloaks and various 18th and 19th century gowns as well. 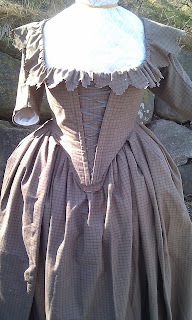 18th century bum rolls, paniers, shifts, petticoats, and stomachers are always being ordered. Many of my orders do not come through etsy. I get a lot of e-mails and orders through my fan page as well. Right now on my calendar I have an order in which I will be replicating a wedding gown from the 1830’s. The gown belonged to the client’s great great grandmother. She would like to have a replica made so she can wear it. The original gets put in the local museum from time to time. When this order is finished both will be displayed together. I am also working with a client from a living history museum. She is an 1835-1840 school house teacher and we are working with the museum to make her a school teacher’s wardrobe. I think first and foremost, I am requested to make more 18th century garments, 2nd Regency and 3rd 1830-1840’s. I also get many orders for infant clothing, like, caps, gowns, petticoats, and robes. I don’t get tons of children’s orders. I do some. I just purchased a young Childs display form and I want to make a young girl’s gown and a breeched boys frock suit. It is hard to find time for those “fun things” when running a business. This is my brand new product line. I thought this was a great idea because historical makeup, beauty products, plants, and their properties always fascinated me. I have always preferred natural products. 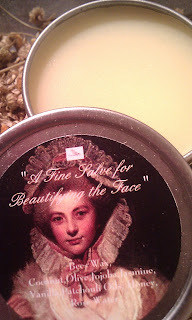 I started off very small just to see how a few 18th century beauty product recipes would do in my shop and they were so well received that they did not last long. I am in the process of making more and adding to what is already there. These recipes are real historic recipes from mostly the 18th century but other time periods as well. Eventually I will hit them all. 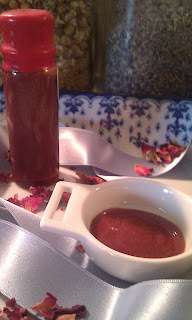 These products include: Lip rouge, teas, powder, salves and more. 6. You have started a business as a seamstress and sutler - tell us a little about your experiences, good, bad, or ugly! In general I have been very blessed and lucky in my endeavors’. I have come to learn some good lessons in both the online shop as well as the “traveling shop”. I love the fact that I have done really well with starting up my business and that I am successful at it. I love that I can be at the laundromat or on the road and working. But with that comes hardships too. You can’t start a business and expect to give it half of your energy. It won’t work. Even sometimes when you give it all your energy it won’t work, so it is best to start small and test out the waters. I love what I do and wouldn’t have it any other way. Having said that I work A LOT. I am ALWAYS working, sometimes it is hard not to work, but you need that down time. It becomes really important. I am at the point where I need to expand and get some help. Right now I wear all the hats and I need to divide my time accordingly to get everything done and still have a life. That is really hard to do. I am also traveling and teaching classes. I have 3 classes coming up in October at Vogue in Evanston, IL. The specifics are on my fan page. Because my job is also a hobby and something I am really passionate about, it makes it seem less like work sometimes. Setting up an actual shop and having an online shop are completely different. 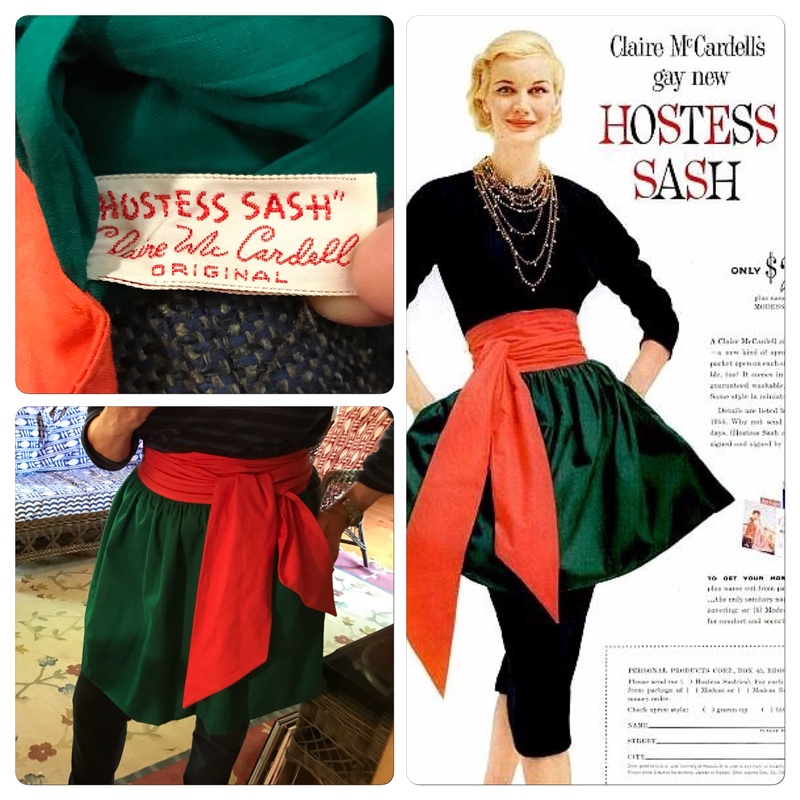 I would love long term to be able to eventually have a store front that combines unique antiques, (architectural salvage, really unique clothing, and one of a kind antiques) with my sewing shop, specific fabrics with notions and such that are hard to find for historic costumers and quilters. But that is in the far off, something to work towards. I am still trying to figure out a good balance for the online shop, the traveling shop and all the hours I put in. Online, I can write on Fb and blogs, answer e-mails, and not have to talk to a single soul. It is easy to forget how to sell face to face. In addition, with all of my clothing being custom made, having an actual suttler shop that sells clothing poses a problem. I now have a few forms set up with examples of clothing. I have a portfolio book with some of my past work. This way I can get measurements and chat with the customers. If they would like to reserve a spot on my calendar they can (I’m usually booked out about 6 months to a year). I also have the beauty product, tea, and other unique items, some that I don’t offer in my online shop. I stay away from items that can’t be documented as well as items that everyone else has. I want to keep my shop unique. I am ok with a small shop. I want to keep the traveling shop to a one day set up. It is a great feeling to have complete control over your job, what you offer to customers, etc. Even if its exhausting at times! I learned that people will always be making assumptions based on the look of your shop, what you are wearing, how quiet and shy you are, as well as the type of event you are set up at. At one event, it was assumed I was “hoity toidy” and snooty amongst other things because of being shy and the “look” of my shop. I am not any of those. You have to have a tough skin, especially when you are face to face with people. I am working on the whole tough skin. I really haven’t needed it before. I try to be positive about everything. It is hard when you wear all the hats. I have to do everything. 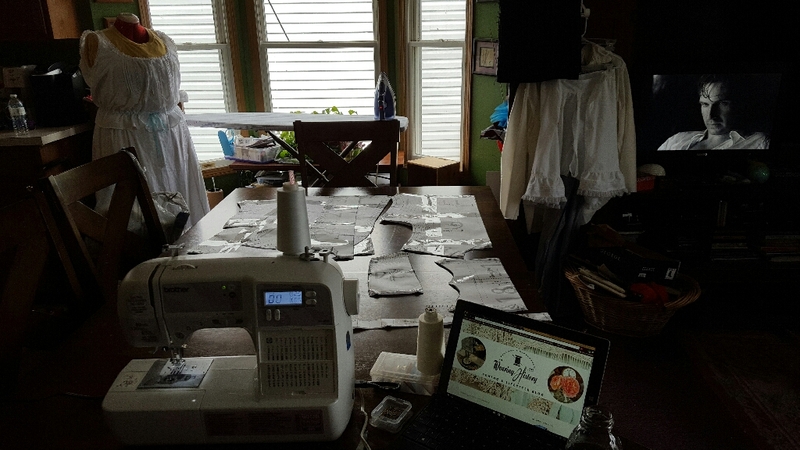 I wish I could sew all day and draft patterns, but usually most of the day is spent at the computer with invoices, e-mails, shipping, designing, packaging, and researching. A lot of the time, I feel completely overwhelmed. But every time I sell something, finish a garment, or have a product line that is a success. It makes the tough times worth it. I try to remember that growth is a process of trial, error, and experimentation. You can learn as much from failure as you can from success. Maybe more. It’s a constant learning process and you need to be able to adapt. Since starting this endeavor over 18 years ago, and opening my store over 4 years ago, I have accomplished so much. I have self-published a few books, I have turned my hobby into a real and thriving business that ships things around the entire world. I love getting up each day and knowing I am doing what I was meant to do with my life. I have hardly had any problems (knock on wood) with clients. I really put my heart and soul into what I do and I think it shows. I love receiving photos of clients, having them tell me about their adventures and who all complimented their outfits. I love getting photos from museums showing how they used my clothing in their exhibits. I love the ability to set my own schedule. It’s hard work but I wouldn’t have it any other way. When I was writing this and looking at the dates of opening my shop and thinking of where I am now, I have even surprised myself with my accomplishments. I keep hoping for that next big brake that will allow my business to grow. 7. What are some of the products you offer in your shop? Where can we buy them? LBCC offers a wide range of products from historically constructed and tailored clothing, to accessories, tea, vintage clothing, and historical beauty products. I am always looking for new things to add. The clothing is custom made to the client’s measurements with hand-drafted patterns. Sometimes I have ready-made clothing and accessories available as well. I make lye soap using historical recipes from my family. I specialize in historical clothing. Most of the time it is all hand sewn, sometimes they are hand finished depending on what the client requests. All of the beauty, bath, and body products are all made from historical recipes and natural ingredients- “Wickedly delicious body care. So good you will think you were born in 1772”. Things are always being added. I also am available for teaching classes. 8. 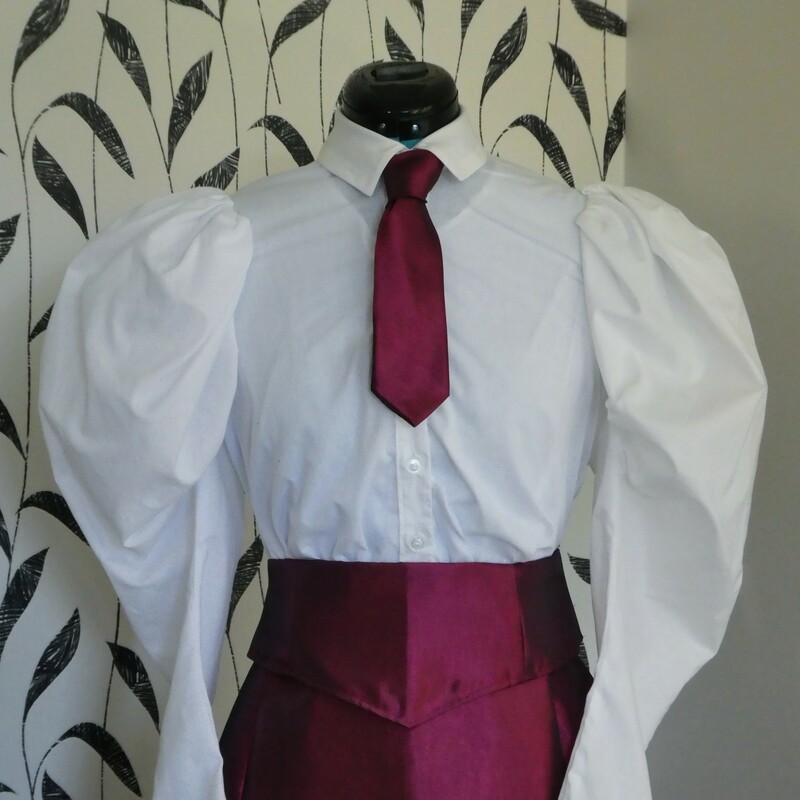 Do you have any advice for seamstresses interested in starting their own business? It pretty much sums it up. Happy Sewing!! She is so talented! Thank you for this interview. this is a very interesting and informative sit, you can visit www.gotw2012.blogspot.com also. Thank you for sharing this awesome idea with us this is really interesting interview .for best collection of Infant clothing you can easily shop this online at got apparel.